What makes the practice so perfect? What does the mantra mean? All Buddhist practices could ultimately be described by the goal “purification of the five aggregates” — through various forms of meditation and virtues (actions and thoughts.) Purification is a core concept. When Shakyamuni Buddha sat under the Bodhi tree, seeking Enlightenment, the sutras record the many things he visualized as he sat. Many of these, such as Mara’s “attack” can be seen as defilements being purified — a core practice in Buddhism. Foundation practice in Buddhism is generally thought of as the process of purifying obstacles and misconceptions and negative karmas, and generating merit. Ultimately, even generating merit is a purification practice itself. 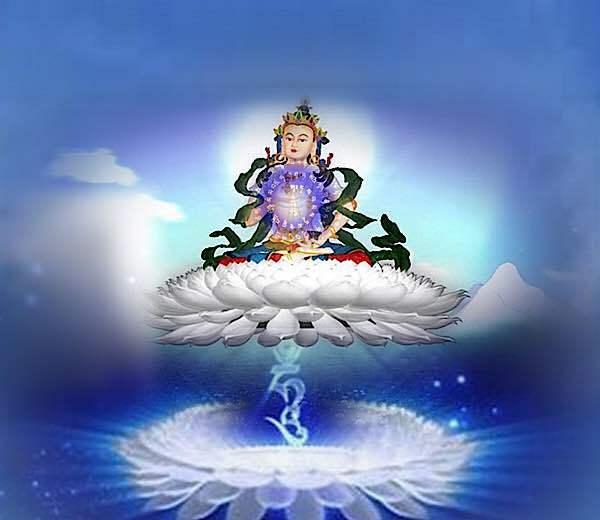 Vajrasattva is visualized as a beautiful glowing deity made of light. Why do we describe purification practices as healing practices? Ultimately, the purification of negativities and obstacles is the most perfect of healing practices. It is said that our defilements and negative karmas are the cause of our suffering, including illness. In Tibetan Buddhism, Vajrasattva’s role as the “great purifyer” is top-of-mind — a necessary first step in Buddhist practice, working on the negative karmas and obstacles that obscure our Buddha Nature. 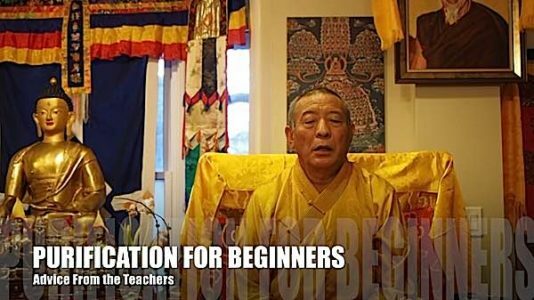 It is one of the core “foundation” practices of Vajrayana. Yet, Vajrasattva practice is much more than this. 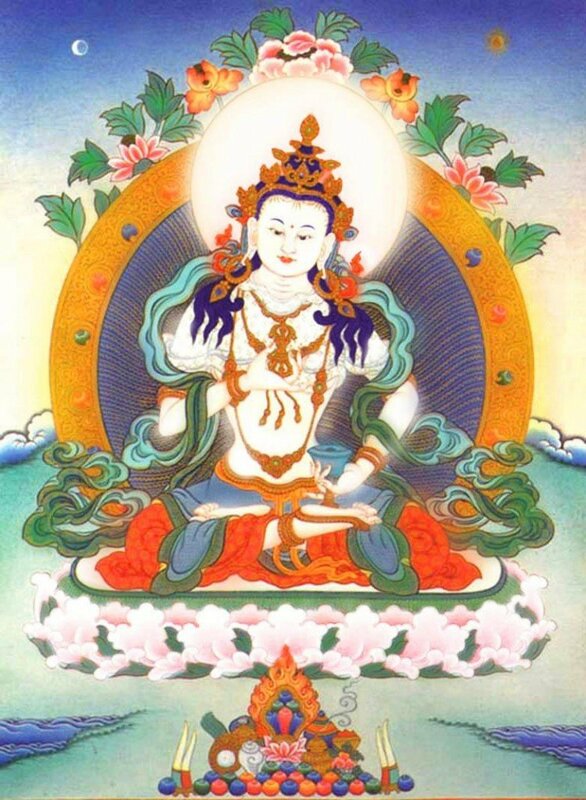 “Vajrasattva is a manifestation of Buddha Conquerer Vajradhara and his practice is one of the most powerful healing and purification techniques in Vajrayana Buddhism.” — Gaden Choling description for a December 2017 Vajrasattva initiation. Vajrasattva is one of the earliest practices in Vajrayana Buddhism and is also central to Shingon Buddhism. Vajrasattva is a beautiful manisfestation of Vajradhara (in the dKar-hGya-pa and DGel-lugs-pa schools of Vajrayana) or of Samantabadra (in the older schools and Shingon.). Vajradhara and Samatabadra are two names for the same concept — the ultimate Dharmakaya aspect of Buddha. 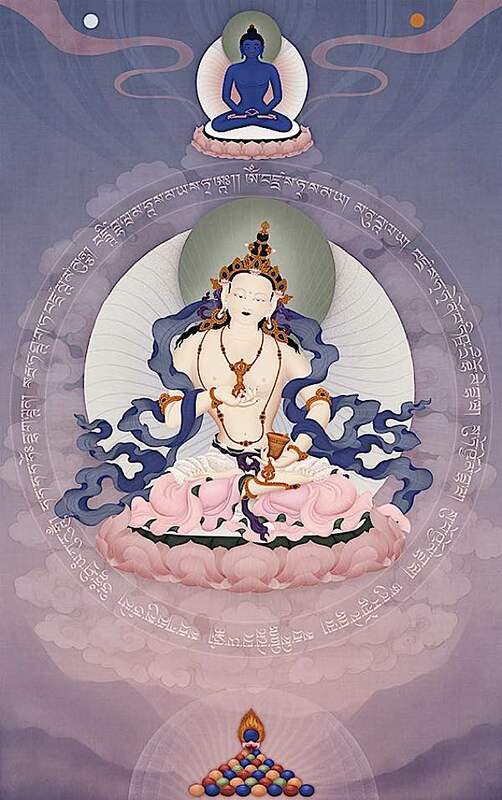 Advanced visualizations of Vajrasattva include his consort, representing the Wisdom of Emptiness. Purification is the “ultimate” remedy. Psychological treatments often include elements of “confronting and purifying” negative past trauma. The principle, in Buddhist terms, is similar. Our “selves” — in fact our very existance— is thought of in terms of aggregates. To avoid the impure obstacle of “ego-clinging” we are taught that all beings are made up of “five aggregates” – none of which contain the “I” or “self.” Each of these aggregates can collect “impurities” — which can be thought of as wrong views and illusory. Purification practice helps us meditate on those impurities, and clear the incorrect perceptions from our confused mindstreams. Perceptions: or how we comprhehend and process things (Sankrit “sanna” or Tibetan “du-shes”): often these perceptions lead to labels, which are an obstacle. Mental Formations: conditioning and karmic activities (good or bad) (Sanskrit “samskara” and Tibetan “du-byed”): the mental imprints and reactions that cause us to act. Consciousness: awareness and discrimination (avoiding the word “self awareness” Sanskrit “Vijnana” and Tibetan “rnam-par-shes-pa”): there are six type sof conciousness. Vajrasattva, like all Buddhist deities, defies the notion of ego. Therefore, there is no “who” and there is no “what.” It can be said that Vajrasattva is none other than ourselves, visualized as a pure Buddha. It can be said that Vajrasattva is an emanation of Akshobya — or of Vajradhara, or of Samantabhadra. It can be said that Vajrasattva, in ultimate reality is no different from any other Buddha. But, it can be said, in relative reality, that Vajrasattva is a caring and loving deity. All of these are true at the same time and none of them really define Vajrasattva. 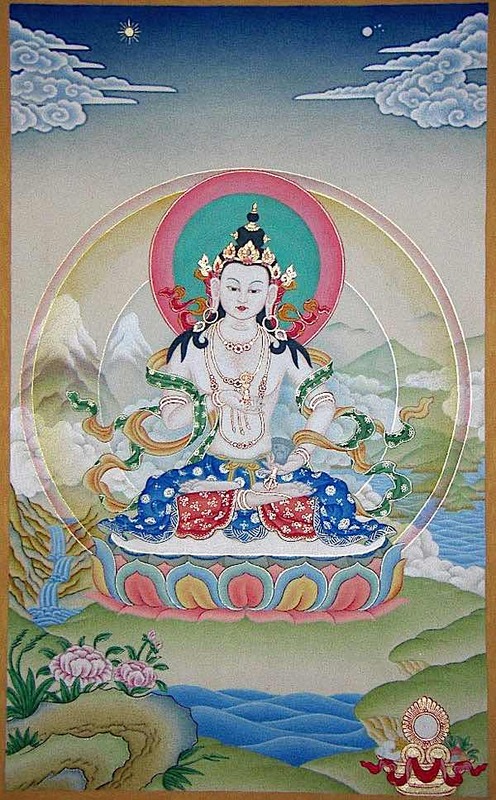 Vajrasattva with mantra wheel visualization at his heart. He sits on a lotus and radiates light which fills us with purifying nectar. We know we can rely on the Vajrasattva practice because of a lineage of masters who have used the practice for thousands of years — many of whom achieved great insights on the path. But what makes it so profoundly effective? We visualize Vajrasattva’s purifying light enters the crown of our heads. 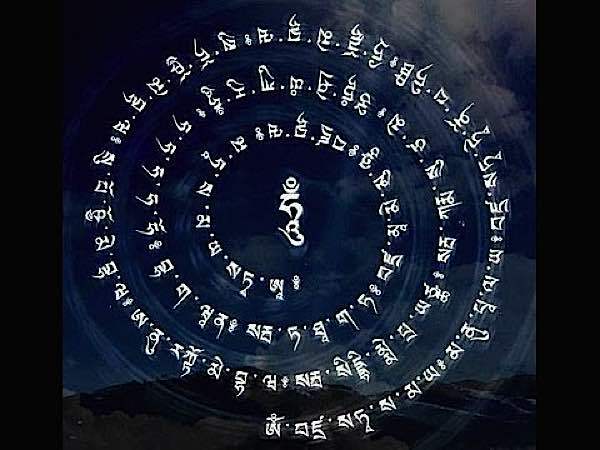 In advanced Vajrasattva practice, we visualize the full 100-syllable mantra in Tibetan characters surrounding the seed syllable Hum, emitting purifying light and nectar from the heart of Vajrasattva. VAJRA = indivisible nature, the inseparability of wisdom and bliss. SATTVA = the being who has the wisdom of inseparable bliss and emptiness. PHAT = destroy all the delusions and sufferings. With most Buddhist meditations there is a reason for every method. This practice is profoundly effective by virtue of its complex simplicity. The complexity of memorizing a 100-syllable mantra, then reciting it with full concentration while visualizing not only a perfect Buddha, but also the mantra script and purifying light — all the while keeping our body relaxed and mindful, with perfect breathing. Yet, once mastered, it is one of the simpler practices. Complex, yet simple. Many teachers tell their students Vajrasattva practice is all they need. After all, most lay Buddhists work day jobs and have family lives, so undertaking Vajrasattva practice is already a major — yet important — undertaking. But the main reason a teacher might say “Vajrasattva is all you need” is because it can be considered a complete and profound practice. 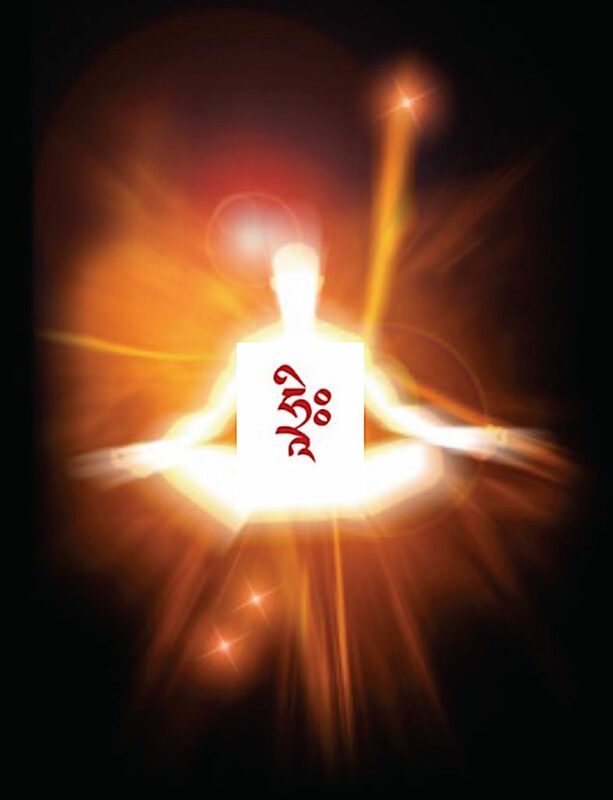 Vajrasattva visualized as a body of purifying light. The Power of Dependence: Taking Refuge in the Three Jewels, Buddha, Dharma and Sangha. The Power of Regret: recalling all of our negative actions in the past motivated by ignorance, attachment or aversion. The Power of Remedy: the mantra and visualization and mental focus on purification. The Power of Restraint: or undertaking to refrain from creating negative karma (actions) in future. When we practice Vajrasattva, as we visualize and chant mantras, we meditate on the four opponent powers. We meditate on the importance of our refuge in the Three Jewels — our true protection. We consider all the things we regret, and we focus on (visualize) our regrets being purifying by the wondrous nectar or white light of Vajrasattva. We then make a promise to ourselves to refrain from negative karmas again — because we know this opportunity to practice Dharma in this human life is so precious. “According to oral instructions, visualize the bodily negativities are purged during the visualization expelling downwards, the negativities of the speech while expelling upwards, the negativities of mind while expelling spontaneously. The negativities of body, speech and mind and their imprints are expelled by doing all three of the above visualization simultaneously. If you meditate like this, then divide the 21 recitations of the mantra into groups of five each: five repetitions for expelling downward, five for expelling upward, five for expelling spontaneously and five for all three simultaneously. Recite the mantra once more to make 21. Another way is to count seven each for the first three visualizations to make 21, without doing the three visualizations simultaneously. “There are different ways to do it. You can choose. 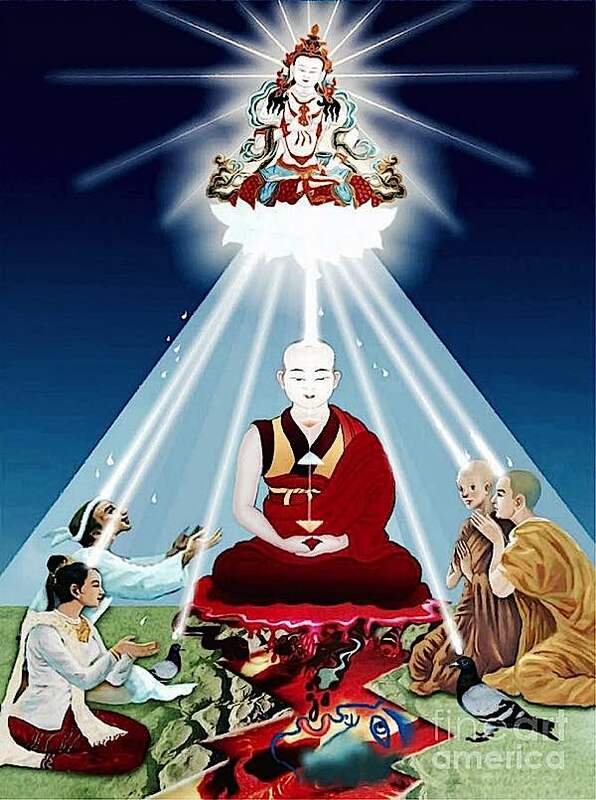 There are many visualizations that can be done during the Vajrasattva meditation and recitation. At the end of however many mantras you recite, develop the strong conviction, “I have actually purified all negativities.” It’s important to generate this conviction because having lingering doubts about whether the negativities have actually been purified is harmful. 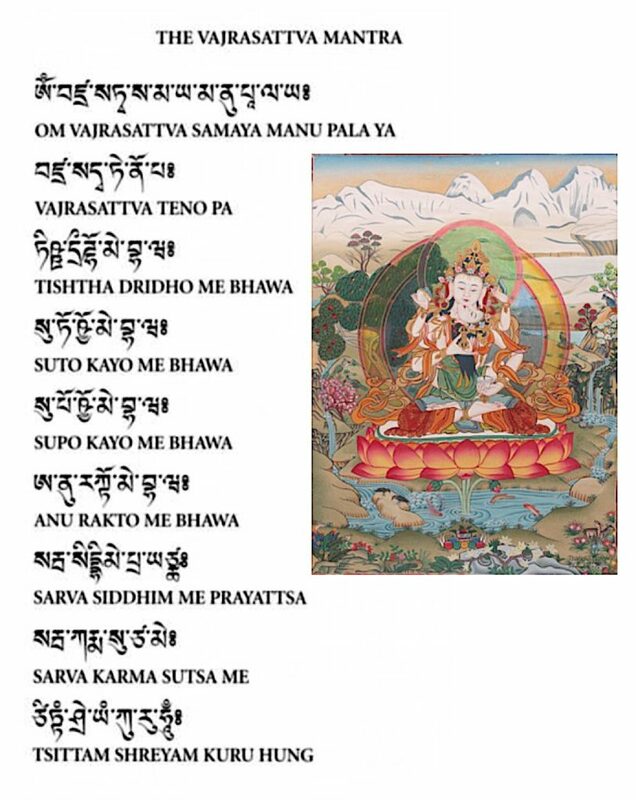 Vajrasattva image and mantra in Sanskrit. Ideally, though, empowerment not only makes the practice more profound and effective, it helps with the transformative understanding of Emptiness and ego-lessnesses. If we have empowerment, we can visualize ourselves as deity — helping us understand the true nature of reality. Intellectually, we might understand the concept of Emptiness, but that’s not the same as developing a realization derived from real, empowered practice. “Imagine — as you say the mantra — imagine purifying nectar coming from the heart of Vajrasattva, and the nectar enters through your your crown [of your head] and enters into your body, first purifying the body. The nectar flowing down through the body. And as if flows down it purifies all the bodily karmas: disease, sickness, unwholesome karmas of the past, unwholesome karmas of the bodies are purified. Say the mantra, lets say 21 times. Then you do the purification again, this time purifying the speech, the speech karmas. This time, the nectar comes down from the heart of Vajrasattva dissolves into you, into your body, and slowly fills up your body, and then [you visualize] the unwholesome karmas of the speech coming out from the mouth. They are expelled. Gone. Imagine your speech karma is purified. The third time, nectar comes down from Vajrasattva’s heart, dissolving into you directly into your heart, and then you mind is purified, mental karmas such as fear, attachment, ignorance, and confusion disappear, are dispersed. Disappeared straight from your heart. This is very powerful.